With the holidays approaching, brands are amplifying their messages to shoppers. Kmart unveiled an ad recently titled, “Show Your Joe.” The ad is for Joe Boxer and includes men dancing in their underwear. 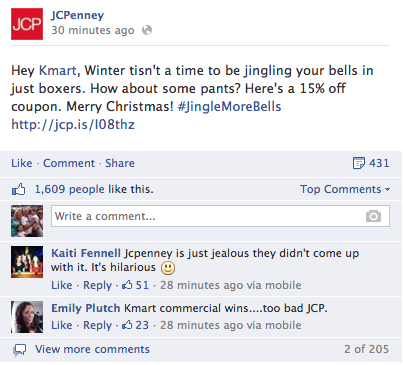 The ad has been getting flack from some people who say it’s ‘disgusting’ and ‘inappropriate.’ But perhaps the best response came Wednesday night from, of all places, JCPenney’s Facebook page. Update: Nice response from Kmart on Twitter. Note to others: Quit taking social media marketing so damn seriously. This is fun, people! This entry was posted in Uncategorized by mattlechner. Bookmark the permalink.